Haaretz journalist says it is 'nonsense' that the smuggling of cell phones to terrorists in prison poses a national security risk. 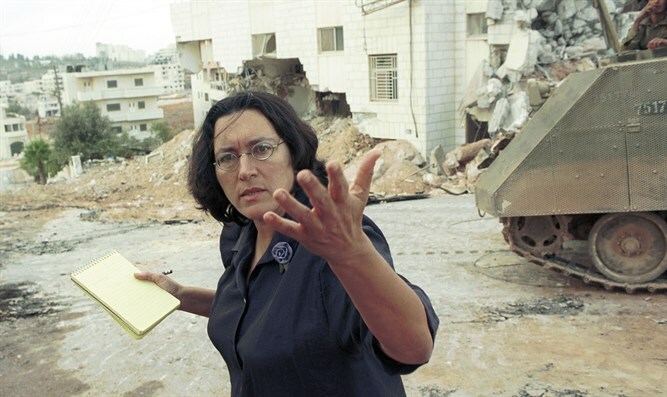 Haaretz journalist Amira Hass, who made her home in the Arab city of Ramallah for years, does not believe that the smuggling of cell phones to terrorists in prison poses a risk to national security. In an op-ed on the story of the smuggling of cell phones to security prisoners by MK Basel Gahttas in Haaretz Wednesday morning, the radical left-wing journalist dismissed the issue as "nonsense that aims to increase ultra-nationalist incitement against Palestinian citizens of Israel through an inflation of the gravity of the suspicions attached to MK Basel Ghattas." She claimed that the smuggling of cell phones in prison is an old phenomenon that is caused by restrictions on the use of public phones by security prisoners, and that the phones are merely used to speak with friends and family and not for any purpose that could be deemed a security threat the vast majority of the time. Hass called on the government to permit Arab security prisoners to use public phones as the only way to prevent the smuggling of cell phones. Deputy Attorney-General Raz Nizri explained why Mandelblit made the unusual move of asking for Ghattas' immunity to be removed before the filing of an indictment against him. He stated that the evidence was solid and that the step would prevent the Balad MK from fleeing the country to escape trial.